Are you ready to shake off those winter woes and welcome Spring with open arms? Barangaroo Orthopaedic & Sports Injury Clinic has lined up a whole range of offers to give you a reason to celebrate the season and (dare we say it?) put a Spring in your step. Make a run for this ASICS offer! 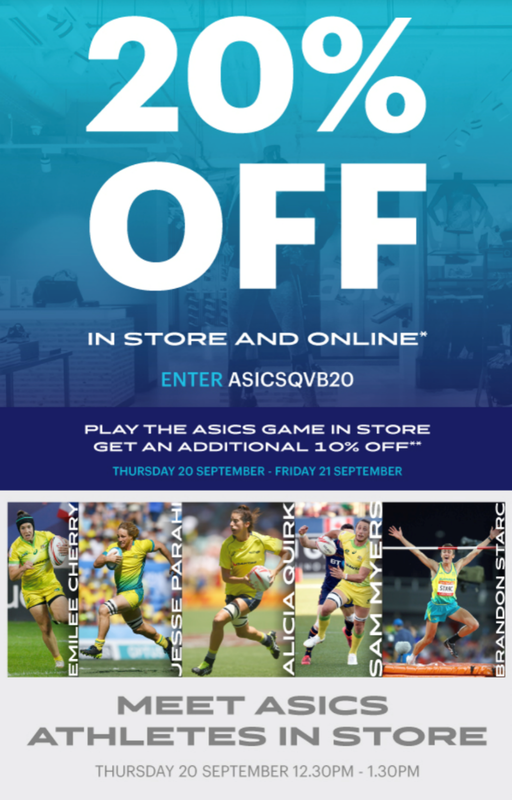 ASICS has a very special offer for all BOSIC customers at their newly re-opened ASICS flagship store at the QVB. Get 20% off storewide on Thursday, 20th September and Friday, 21st September! What’s more, when you play and win the ASICS games in-store, you can get an additional 10% off. But wait, there is more! Rub shoulders with Australia’s sporting elite like Rugby Union players Emilee Cherry, Jesse Parahi, Alicia Quirk and Sam Myers as well as high jumper Brandon Starc. Get your feet, footwear and fitting sorted at ASICS QVB. Over the past month, our Physiotherapist Nathanael Chan has been learning the ropes to become an internationally qualified MDX-System Therapist. What is MDX-System, you ask? It’s all about understanding and analysing the relationship between muscles, joints and the inter-relationship to movement patterns. 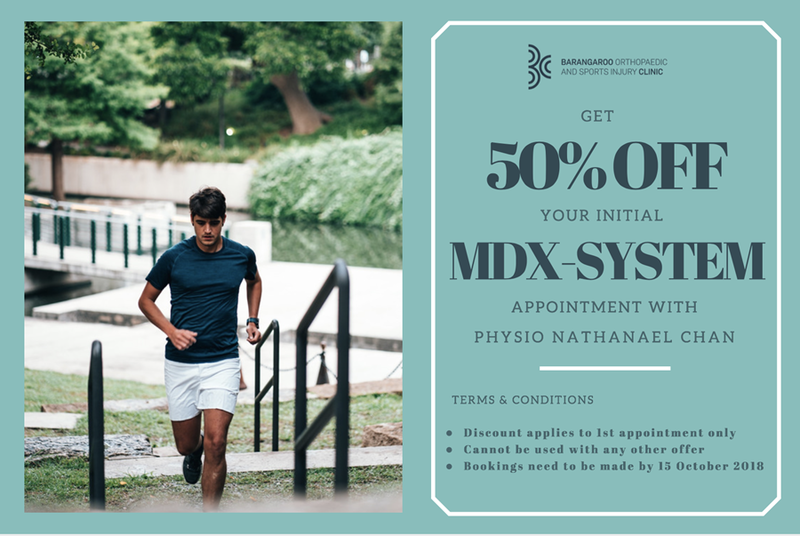 Nate can optimise your walking, running and movement patterns by targeting specific muscles to improve strength, along with a three-dimensional stretching treatment program. Whether you want to improve muscular strength and endurance, reduce pain, or improve your athletic abilities, Nate has got the answer for you. Book your MDX-System appointment with Nate. Barangaroo Clinic’s very own Spinal Surgeon Dr Michelle Atkinson shares her tips on how to look after your spine by building up strength in your bones, muscles and core. Did you know your spinal bones or vertebrae are alive and are constantly being broken down and rebuilt? Your peak bone mass is achieved when you’re 25 years old, after which you slowly lose overall strength. It is so important to feed your spine adequate calcium by eating calcium-rich foods. Your body requires 1000-1500mg of calcium which is found in dairy products like milk, cheese and yoghurt as well as in seeds, leafy greens, legumes and seafood. Chances are, like most Australians, you’re deficient in Vitamin D. Expose your skin to the sun 15 minutes each day either before 10am or after 4pm for your daily dose of Vitamin D, which allows your gut to absorb the calcium. Load your spine to stimulate more bone to rebuilt, rather than broken down. Impact exercises such as skipping, jumping, running, walking and weight lifting are excellent. Our Exercise Physiologist Rachael Kent can work with you to develop a program. Strengthen your spinal/core muscles to support the spine; it cannot remain upright without muscular support. Engage the core when loading the spine to protect the discs and facet joints which allow spinal movement. Our Physiotherapy team of Sam, Jerome, Nate an Karen can direct and monitor your progress to a healthy core. Find out more about Orthopaedic. Strawberries might be making the news for all the wrong reasons, but here’s a recipe from BOSIC’s Dietitian Nicholas Gala that elevates these bountiful berries to the status they deserve. Go on, whip up this smoothie – it’s not just healthy; it’s not just healthy; it’s downright delicious! To make, simply add all ingredients to your blender and whiz until smooth. 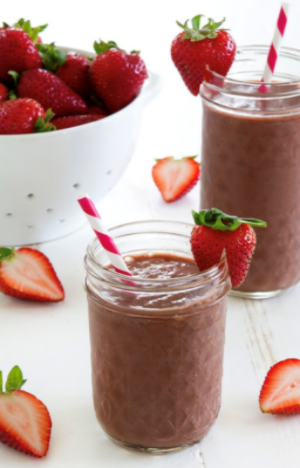 This berry smoothie is a perfect on-the-go breakfast or snack for those busy days! It is packed with protein, healthy fats and antioxidants. You can also add half a scoop of vanilla whey protein and enjoy this as a post-workout snack to aid recovery.